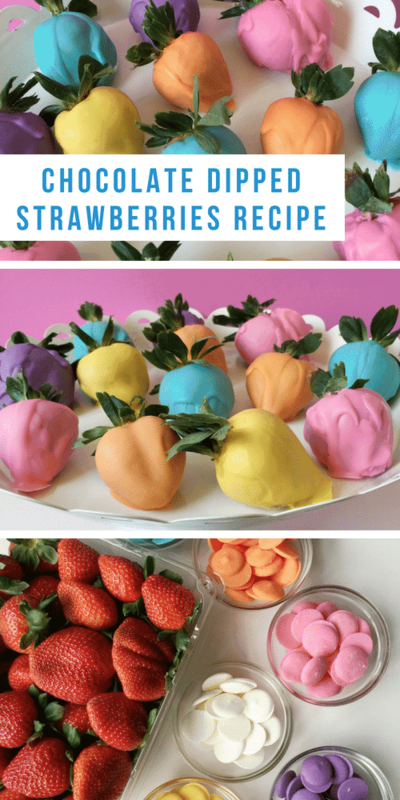 For the spring and summer, I thought that it would be fun to brighten up your typical chocolate dipped strawberries recipe and add some more color to the mix. I mean that quite literally of course! Instead of showcasing chocolate brown, why not opt for some bright pinks and oranges and yellows? Super fun! Now is the perfect time to play around with the bright and the bold. Your kids will love these designs … and your neighbors will too. 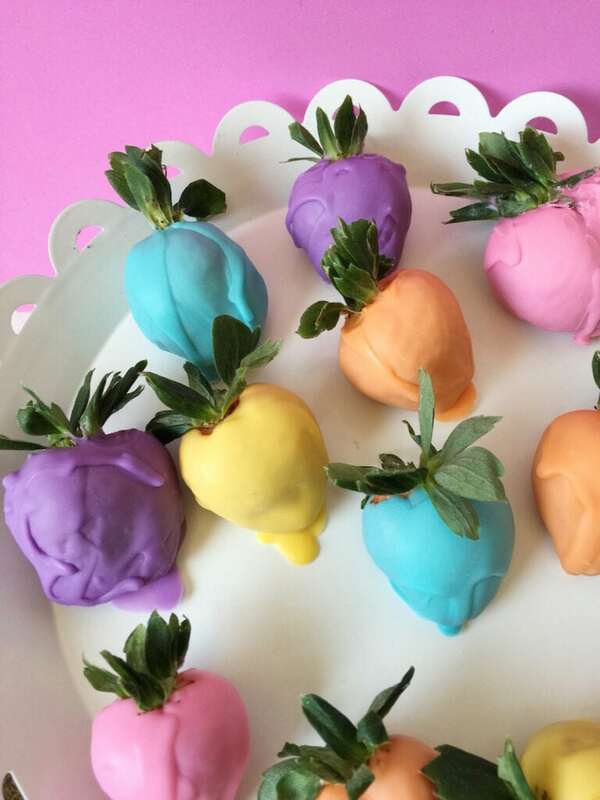 This Chocolate Dipped Strawberries Recipe is easy enough to make. You just need to swap out your base. Of course, the juiciest and freshest berries are an absolute MUST. But search for some melting chips online to replicate this look. I got all of these styles on Amazon. Prime is magical. You can make these in less than 48 hours if you order right now. Line a cookie/baking sheet with wax paper and set aside. Rinse strawberries and dry completely. Place in refrigerator to chill. Place the various colors of melting chips in small microwaveable bowls. Microwave each bowl one at a time, for 30 seconds. 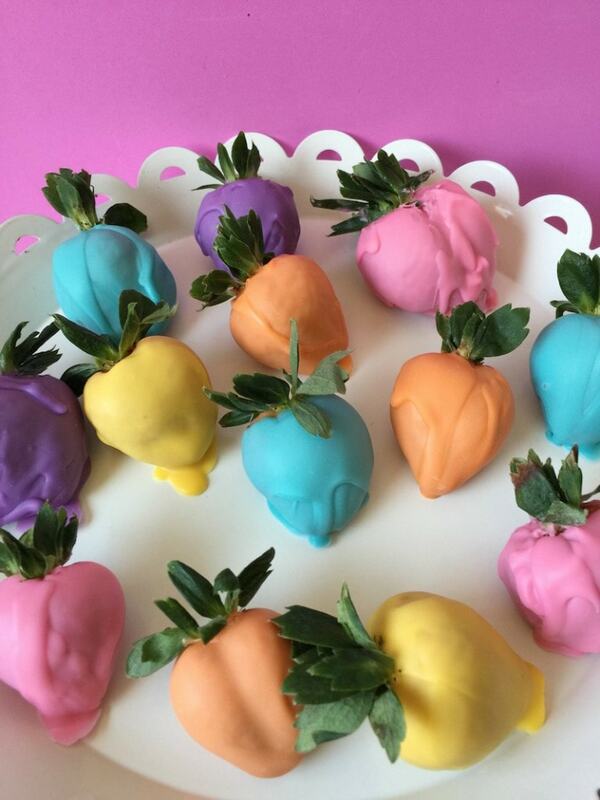 Using a spoon, drizzle the melted chocolate onto 2 strawberries, covering completely except for the stem. Lay on a baking sheet to harden. 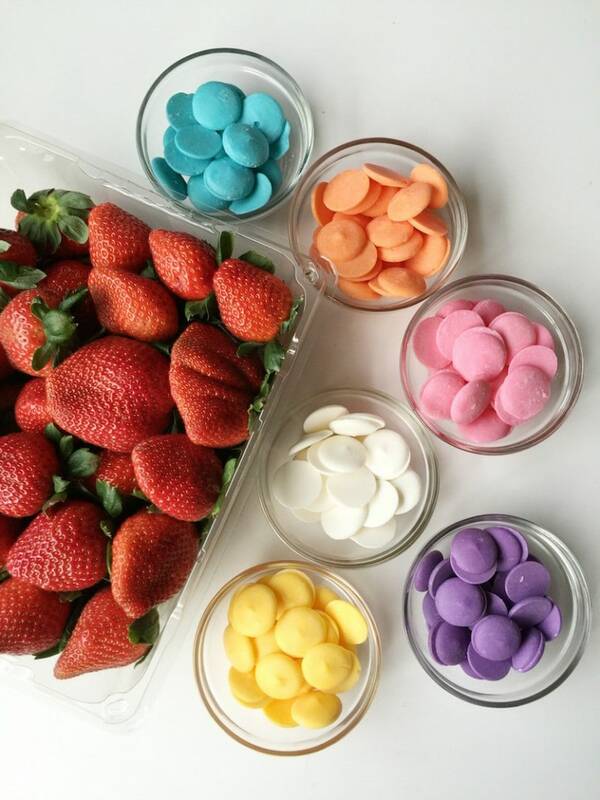 It will not take long to “set” because the strawberries were chilled. Repeat steps for all the colors you’d like to add. Store in an airtight container in the refrigerator up to 3 days until ready to serve. It would be better if you ate them closer to when you actually made them though – full disclosure! ENJOY!! Line a cookie/baking sheet with wax paper and set aside. Rinse strawberries and dry completely. Place in refrigerator to chill. Place the various colors of melting chips in small microwaveable bowls. Using a spoon, drizzle the melted chocolate onto 2 strawberries, covering completely except for the stem. Lay on baking sheet to harden. It will not take long to "set" because the strawberries were chilled. Repeat steps 3 and 4 for all 6 colors. Store in an airtight container in the refrigerator up to 3 days until ready to serve. 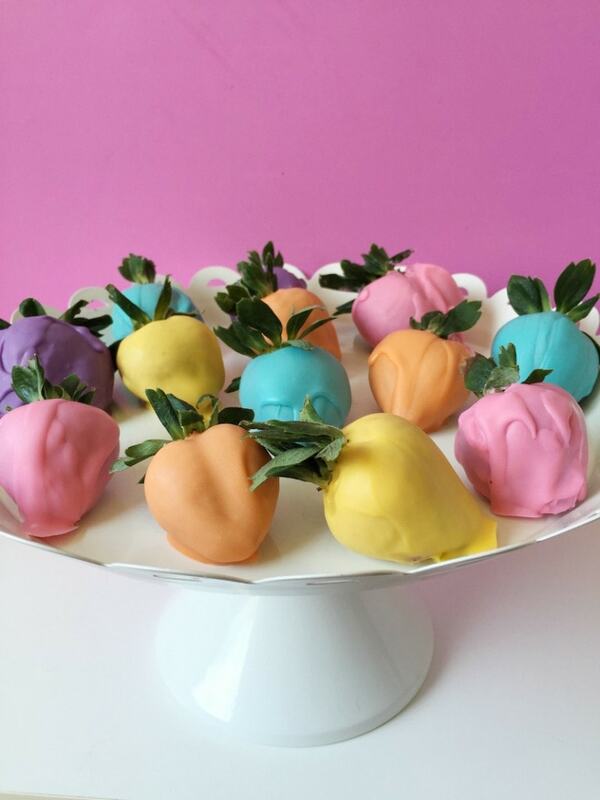 What do you think about this Chocolate Dipped Strawberries Recipe? Are you going to give it a try?